I was happy to see that VPI will be using a new tonearm lift cylinder that is sourced in the USA. The old lift cylinder was made abroad. The old lift was prone to malfunctions and defects (just check out the posts here), and was probably the weakest and single most frustrating element of VPI's tables. I hated it. Thanks, VPI. Good to know Orchids! I had to replace my cuing lever as the fluid had leaked out. Hopefully the one made in the US is better designed and built to prevent fluid leakage. The housing in the photo looks brass-colored, rather than the chrome finish currently used. Now VPI can say everything in their tonearm is designed, manufactured in the USA. I hope it won't cost an arm & a leg when the Jelco tonearm lift needs to be replaced in the future. I hope it's a retrofit for us using the JMW arm equipped w/ the older Jelco unit. Orchids1 wrote: I was happy to see that VPI will be using a new tonearm lift cylinder that is sourced in the USA. The old lift cylinder was made abroad. The old lift was prone to malfunctions and defects (just check out the posts here), and was probably the weakest and single most frustrating element of VPI's tables. I hated it. Thanks, VPI. Agreed! I futzed with mine (on the HW-19 jr) for quite a while before I got it to work properly. Just a week ago, I decided to do a general maintenance of the arm column assembly. Its been a few years and a clean up is a good thing since dust, dirt, you name it is there. Although my arm lift mechanism works fine, I decided to dismantle it and check the lube. I have the right silicone grease on hand (300,000cst). I dismantled very carefully using jewelers screwdrivers and noticed the piston nearly empty of any lube. Looks like it was on its last leg. I cleaned up every part with alcohol, dust bust every part, inspected every part for any defect, there was none. I freshly lubed the piston and reassembled everything. A bit of offset adjustment needed at the lift platform so its angle is correct to the tonearm lift point. The drop is now a wee bit slower and I feel its ideal timing. When lubing, just sufficient is good, never too much and it may be too sticky or stuck. The last detail is the black pads at platform and bottom of tonearm have deteriorated. I found a very suitable self adhesive cushion material (used as furniture protectors) and cut one out for it. Its perfect at 1.5mm thickness, no more. As for the tonearm side, I punched out a 3/8" 1mm flat plastic and carefully stuck that on. The lift and descend is precision like. I believe this will last much longer than the original stuff or forever. Thats my story. I have a picture of the exploded parts if anyone is interested. P.S. I noticed the barrel bottom is not covered. I carefully stuck a piece of 3M transparent tape to cover the bottom. No operational side effects and good prevention from external contamination. bslee wrote: Just a week ago, I decided to do a general maintenance of the arm column assembly. Its been a few years and a clean up is a good thing since dust, dirt, you name it is there. Although my arm lift mechanism works fine, I decided to dismantle it and check the lube. I have the right silicone grease on hand (300,000cst). I dismantled very carefully using jewelers screwdrivers and noticed the piston nearly empty of any lube. Looks like it was on its last leg. I cleaned up every part with alcohol, dust bust every part, inspected every part for any defect, there was none. I freshly lubed the piston and reassembled everything. A bit of offset adjustment needed at the lift platform so its angle is correct to the tonearm lift point. Yes, some pics would really help. Also, what sort of lubricant did you use and where did you source the felt pad? The lubricant is Dow Corning 300,000cst type silicone fluid. Thinner viscosity types are frequently used for tonearm damping but not suitable for the arm lifter. Its a very thick tar like viscosity and I've found it suitable to a wide range of arm lifters for many popular arm lift mechanism which works like new. The trick is never too much and buttered thinly with just the right amount will be good to go. Everything have to be surgically cleaned up before the lube application. Please don't use alternative lubes found in automotive like STP or the likes. The only difference in various arm lift mechanism is the complexity or ease of dismantling procedure. Some maybe a little more difficult, some quite easy. There's one type with a small snap ring that makes removal a more difficult. This Jelco type is quite easy but as with anything else, extreme care and cleanliness is must. 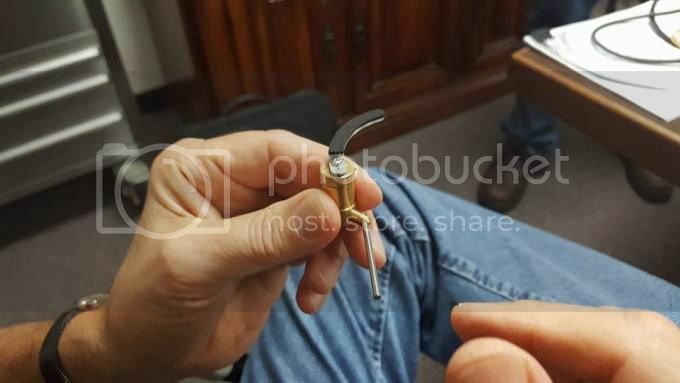 Have the exact fit jeweler's screwdriver in hand to work the 2 little screws. Most of the parts can be soaked or cleaned in alcohol and only old lube or dirt is dissolved by the solvent. Fortunately I did not find any defect or unusual wear in each moving part. If there was, a whole new replacement would be the total solution. 1)Piston - Butter the lube just enough to fill the 2 grooves and a super thin film around the circumference. Do not overfill. 2)Lever - A tiny drop at the 2 ends (or at the lever bore at cylinder) and at the piston bottom end. Test to ensure its operating smoothly and after dropping the piston into the cylinder. Then lock it all up. 3) Arm lift platform - There's a tiny guide pin there, A tiny, tiny drop there too. One tiny detail. Before you unscrew the barrel top cover, note EXACTLY the position of the locking screw to the barrel. A different position will alter the platform lift alignment. When reassembling, I hope you can lock it back in the same precise manner. As for the felt pad, where I reside, The original 3/8" felt pad on the arm side is not available where I reside, so I had to think of something else instead. A flat thin 1-1.5mm solid plastic pad punched out with sharp hole punch would do fine, just stick it on permanently with thin double side tape. Previously I tried a tiny plastic semi spherical bumper but realized they were too thick and raised the level a bit too high. I'm satisfied with this alternative plastic piece. Again, I'm limited to what I can find at local hardware shops, but I did find a packet of thin 1 1/2" self adhesive rubberized cushion bumper protector discs. The surface is very even and smooth, although its not black but grey, but color is not an issue. I had earlier removed all remnants of the lift platform felt, cleaned it up thoroughly ready for the new piece. Everything have been working fine now and hope it its all flawless operation and will last for a long time. Here's arm underside and lift platform with new cushion. Hi bslee, your detailed instructions and information are much appreciated!